Mowing the lawn can be an arduous task. Luckily, modern tech companies have noticed the problems that mowing a garden can present and have come up with a nifty solution: the robotic lawn mower. If you just want an instant recommendation, we consider the Robomow RS635 the best robot lawnmower on the market right now. It's one of the best lawn mowers of any type that you can buy. It sports a robust build, can tackle any slope up to 36 percent and packs really big blades that can slice through rough grass with ease. Want more options? Then read on. Getting every piece of grass an even length, making sure that every area is covered, and so on can be annoying, and that's not to mention inclement weather conditions. 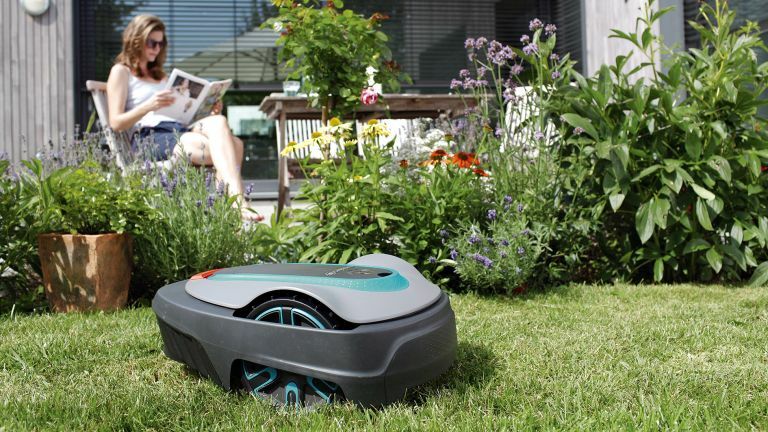 As the name suggests, robotic lawnmowers are just that. They happily move around a garden, cutting grass to an equal length and navigating tricky terrain while you kick back and relax. Depending on your garden type, different mowers can work better than others - for example, if you have a MASSIVE garden you'll want a large lawnmower with plenty of battery life, and if you have a small-but-hilly garden you'll need a mower with plenty of power and grippy wheels. Blade width is important, as are other features, such as the ability to remote control the mower with your smartphone. One man went to mow. Actually he didn’t, because he sat on his lazy arse while a robot did it for him. The Robomow is our pick of the robots and is a great option for big undulating gardens with tricky-to-reach areas. Its 56cm blade is big enough to make an immediate impression and it’ll happily negotiate that 20% incline you used to hate mowing. As with all clever robots, once it’s reached its 100-minute battery limit, it’ll amble back to its cosy base for a quick recharge before heading out again. And again. And again. The Robomow RS635 is best for big gardens with hard-to-reach or rough grass. Its big blade means it can get through a lot of cutting in a short period of time, and it'll manage up to a whopping 5,000 square metres in total, and grass up to 80mm long. Add a relatively low noise level and you have an ideal purchase for lazy gardeners. Flymo, the well-known garden appliance brand, has excelled itself with the 1200 R. The mower, which costs £650, is best for people who want a clean cut with no tyre marks or grass left around. According to the company, the 1200 R has a blade that is specifically designed to reduce mess which, when coupled to the excellent range – 400 square meters – makes for a very useful machine that just gets the job done. The mower is exceptionally quiet, at just 58dB, which is roughly the same volume as a spoken conversation. Great value. Ideal for small to medium size lawns of up to 1,000 square metres, the McCulloch ROB 1000 is an ideal entry point into the robot lawnmower world. It’s not particularly flashy or feature-packed, but it performs all the usual robot lawnmower duties – automatically mowing the lawn within its boundary wire, according to the times and dates you've programmed into it, and returning to its docking station to recharge when its battery gets low. It also includes an audible alarm and PIN protection to help protect it against theft. And it can handle inclines of up to 25% – handy for sloping gardens. The McCulloch ROB R1000's biggest catch? It can only mow within a single zone (that is a front or back lawn). Many of its rivals can handle multiple zones, enabling the whole garden to be mowed. McCulloch ROB R600 review: can this robotic lawnmower tame T3's garden? There’s a good argument for getting a Honda. After all, the company has been at the forefront of the burgeoning garden robotics industry for many years and we all know about Honda’s excellent reliability record in all matters mechanical. If its humanoid robot Asimo can walk, dance, kick a football, interact and carry things, it’s probably safe to say the company’s Miimo mower will cut a lawn reliably and with very little fuss. The Miimo 310 is designed for gardens up to 1,500m2 and has a cutting width of 22cm and a 22.2v lithium battery that provides up to 40 minutes of cutting time per 30-minute charge. Some of its most impressive features include the ability to handle inclines of up to 45%, operate in all weathers (snow perhaps notwithstanding) and even be programmed to cut complex-shaped gardens with pathways and passages in between. As with all robot mowers, it’ll take about a week or so before you’ll see the fruits of its labours but, before long, your lawn will look spick and span without you so much as having lifted a finger. For best results – and fewer back problems – get Honda’s installation team to set it all up for you. Top dollar cutting from a highly reliable brand. If you’re a busy city-dwelling bod with a small garden up to 250 metres square, this relatively affordable 16cm ‘city’ model could just be the answer to your overgrowing sward conundrum. The Sileno City’s Lithium battery provides a continuous cutting time of 65 minutes before the mower heads back to its base station for a nifty 60-minute top-up. It’s quiet, too, and water resistant against both heavy rain and blasts with a hosepipe. As is the case with most robot mowers, you’re advised to remove any raised garden borders or the mower will stop an inch or two from the flowerbed, leaving an unsightly strip of overgrown grass, to which you’ll then have to take a strimmer. And, as any gardener will tell you, strimming is arguably the biggest pain of all garden duties, leaf clearance notwithstanding (see our separate feature on garden blowers). Also, make sure your garden isn’t too hilly because this mower’s maximum inclination is a not especially impressive 25%. The Sileno City cuts very well, albeit slowly, and is very adept at negotiating tight turns in confined areas. The bubble-type keypad interface is relatively easy to use too (it comes with its own onboard programming assistant), but those with poorer eyesight might have trouble reading the LCD screen in bright sunlight. Of course, there is a good argument against having an expensive robot mower that cuts such a small area – after all, it wouldn’t be that much of an inconvenience to get off one’s arse and have a quick 10-minute whizz with a cheap cordless or electric model. But that’s your prerogative. The Smart Sileno+ is part of Gardena’s smart system range, which includes things like electronic timers and automatic garden sprinklers. That’s handy because the devices not only talk to each other when connected to a gateway via your home router, they also have internet access as well – and that means you can control them remotely using the free Gardena smart system app for iOS and Android. Clever. In practice this means that the Gardena Smart Sileno+ robot mower knows only to mow the garden when the garden sprinkler isn’t working. It also includes Gardena’s SensorCut System, which effectively measures the height of the grass so it only cuts your lawn when necessary. Anything else? Unlike less capable mowers, Gardena Smart Sileno+ can handle complex, sloping lawns (with inclines of up to 35%) and can navigate even narrow areas with ease. John Deere makes some of the most reliable utility equipment around – and the Tango E5 Series II is no exception. It works in any weather condition across almost any terrain and does so quickly and quietly. Oh, and it has a range of up to 2,250 square meters. Of course, lots of other mowers do that, too, but the Tango E5 is famous for its star-shaped blade design and quality, which John Deere is proud to talk about. Obstacles, like rocks, are protected against, which reduces the need to replace the blades or make repairs to the mower. The focus on blades may seem trivial, but its something that makes the Tango E5 Series II one of the best robotic lawnmowers around.